Teams from 20 businesses across the city descended on the University of Birmingham for the 2017 Birmingham Business Games which took place on Tuesday 5th July. After a mass warm-up, each of the teams competed in 5 activities including Dodgeball, Mini Tennis and Sitting Volleyball. Points were available in each event which created an overall leader-board at the end of the evening. In quick-fire sessions, teams were given a basic overview of the sport and then had 3 matches each. With rankings based on points difference as well as the number of wins, the matches were fast-paced with teams having lots of fun as the ball pinged around. There were dominant displays in each of the rotations with five teams achieving a 100% record. Oaks, Hozelock, Weightmans and PIB all recorded three wins as well as local charity Sport 4 Life who were the most successful team with a points difference of +19. 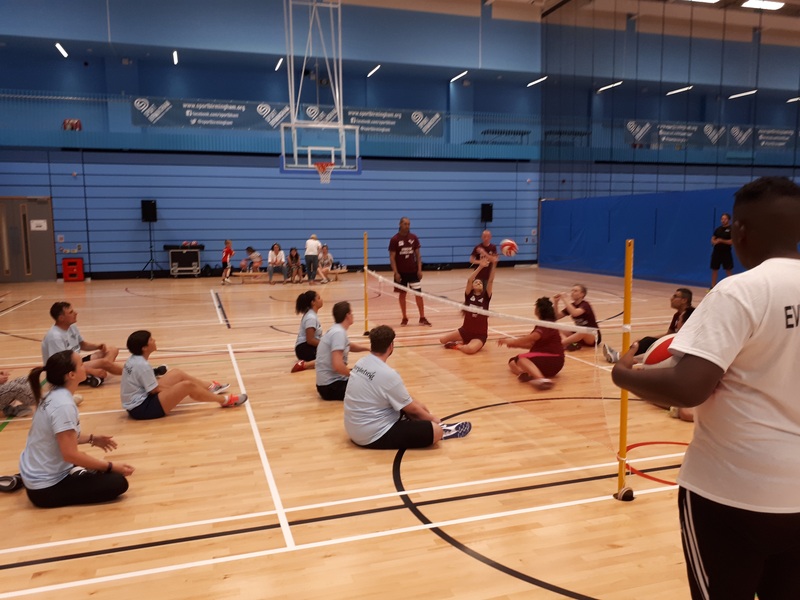 Their win in sitting volleyball helped them to a second placed finish overall, just behind Birmingham City University who won two of their sitting volleyball matches. The event was organised by Sport Birmingham with support from Purple Frog and Love Brum. A fantastic team of staff and volunteers ensured the event ran smoothly, with a special mention going to Isabel, Ky and Kelly who officiated and scored the sitting volleyball matches. Volleyball is an ideal sport for staff engagement activities. To find out more or to look at organising an event, please get in touch.